If you’re finding it difficult to read things on your computer because they look a little small on your screen, there’s a quick way to remedy this in Windows 7. 1. Open the Start Menu in the lower left and select Control Panel. Firstly right-click a blank area of your taskbar and select Properties. In the resulting window, make sure the “taskbar” tab is selected and you will see the following options:. Lock the taskbar – bbviously named. If this is selected, you cannot re-size or move your taskbar. This is perfect for folks who find their taskbar on top of their screen one day and can’t remember why. Auto-hide the Taskbar – great for the neat-freak who wants a perfectly blank desktop. Select Auto-hide and your taskbar with only peek out when you mouse-over the bottom portion of the screen. Use small icons – if you think the icons on your Taskbar are too big, then select this option. Depending on which version of Windows you have, there may also be an option to relocate your Taskbar on the screen (you can also click, hold and drag your taskbar to a different place, too!) as well as a drop-down box to set whether or not open Taskbar buttons combine when more than one instance of the program is open. Finding a date in Windows 7 is super easy – you just click the clock on the Taskbar and you get an easy readout of the month. 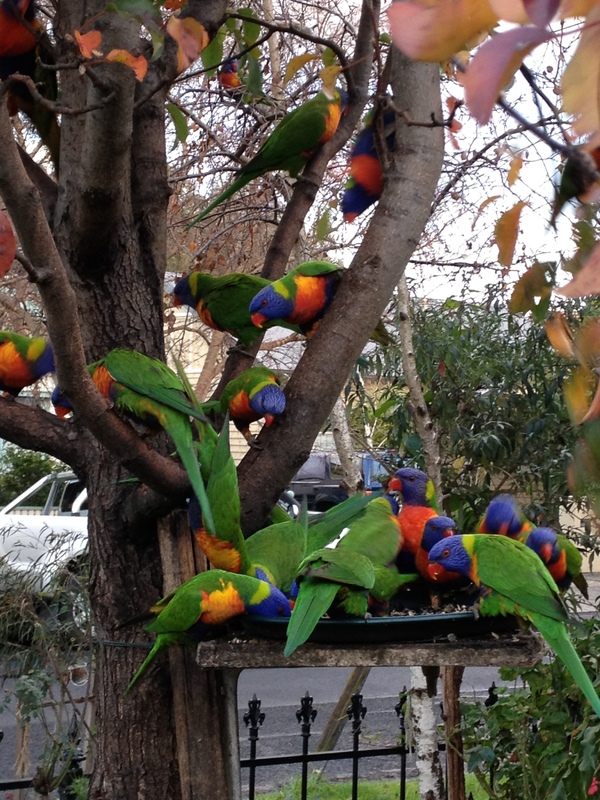 And clicking the arrows moves on to the next (or previous) month…. but did you know that if you click on the name of the month…it goes back in sequential steps to show the whole year and even whole decades? 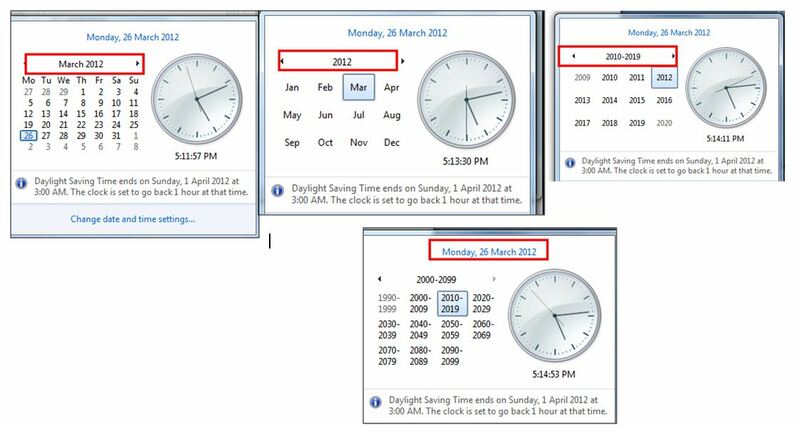 Return back to the present date by clicking the current date across the very top of the window. 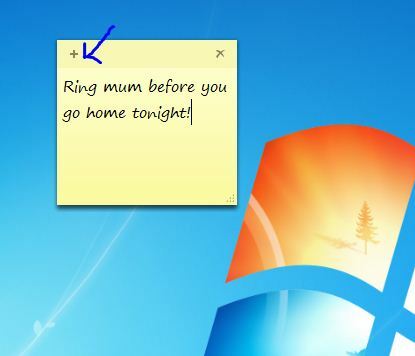 Just type “Sticky Notes” into your Windows 7 Search Box (Located above your Start button) and hit Enter. The Sticky Notes gadget will open up (it looks just like a PostIt note). Next just type your list or note and you’ve got yourself an instant desktop resident reminder! You can even change the color by right-clicking and if you wish to another one, simply click the plus sign. 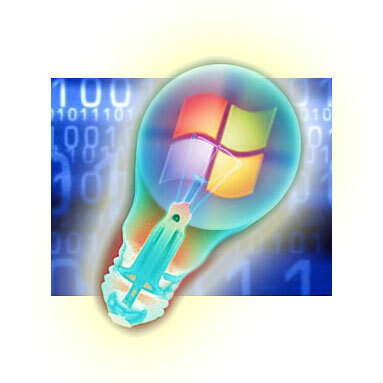 Just hold down the shift key and then click the program’s icon – in our example below this is opening a second copy of Microsoft Word by shift clicking the Word icon on the Task bar. 3. 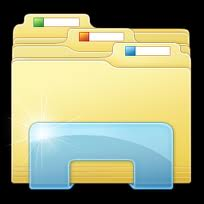 Click and Folder and search Options. 5. 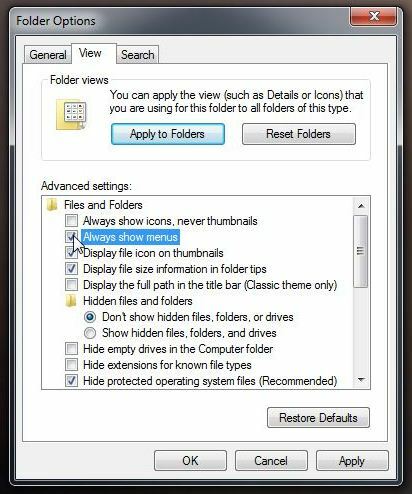 Select ‘always show menus’ and then click OK.
You can easily use cursor arrows to manipulate open windows in Windows 7 with these simple steps:Hold your Windows key ( the Windows key is the one located between your Ctrl and Alt keys on your keyboard and has the Windows logo on it).